As you pack up and head to the beach this summer, reduce your waste and environmental impact with the following tips! Zero waste: strive to pack everything in reusable containers/bags in order to leave no trace (this is especially important for Plastic Free July!). 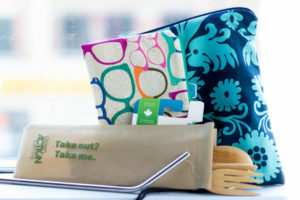 This means packing all of your supplies, snacks, and drinks (especially water) in reusable containers, bags, snack packs, wet bags, and bottles. Say no to single-use plastics by bringing your own cutlery, plates, bowls, and reusable straw with you. Everything you bring with you should be brought back home with you. If you do bring packaged items to the beach (cardboard and recyclable-plastics), be sure to put them in an available recycling bin (whether directly at the beach or back at home). Snacks: a lot of the “typical” beach snacks are highly packaged (especially in plastic), like chips, granola bars, cookies, etc. Choose your snacks wisely, and pack everything in reusable containers and bags (say no to Ziploc bags and plastic wrap!). Avoid packaged (and often unhealthy) snacks by choosing fresh foods (from your local market!) and snacks you can make yourself (like these granola bars or chips). Save organic scraps in one of your containers and bring them home to compost. Sunscreen: every chemical-based product that you buy can harm the environment. Do your research to find organic, low-chemical, paraben-free, and/or biodegradable sunscreens that are better for your skin and the planet. There are a lot of DIY sunscreen recipes floating around online, but be sure to do your research beforehand for this as well. Give yourself and your skin a break from the sun by wearing protective clothing, taking breaks in the shade, and drinking plenty of water. Swimwear: studies indicate that microfibers in our clothes are poisoning our waterways and food chain on a massive scale (read more here). This is why it’s important to choose wisely when it comes to the clothing you’ll be wearing at the beach and in the water this summer. If you’re looking for swimwear, some eco-friendly Canadian options are Azura Bay, Bikini Empire, Beth Richards, Bare Beach, Thief&Bandit, Saltwater Collective, Imagine Perry, and Minnow. Buying good quality, eco-conscious swimwear that lasts beyond one season is much more sustainable than what’s “new and trendy” for the season (and often cheaply made), which contributes to the fast fashion problem. Don’t forget about other beach clothing items as well, like your towel and sandals! Choose items made from organic and sustainable materials, and buy as local as you can. Share the ride: if you’re going for a solo-trip or driving to meet-up with your group, perhaps there’s someone you could share a ride with along the way. Use the single-trip matching feature of GoManitoba to post/ look for a trip to and from the beach. By carpooling, you are cutting financial costs and emissions. If you’re thinking of cycling to the beach (Biking from Birds Hill Park), you can also use GoManitoba see what your route options are and find a cycling buddy! Plastic gear: a lot of beach gear and accessories (toys, life jackets, floats, etc.) are made of plastics with unsafe properties like PCVs (polyvinyl chloride), phthalates, and BPAs (Bispehnol A). The Soft Landing has put together a great guide when it comes to purchasing this gear. They recommend borrowing, sharing, or buying used items when you can, and if you are buying new gear, there are sustainable brands and options out there. Plogging: a Swedish term and trend that combines jogging and picking up trash. Why not leave the beach a better and cleaner place by picking up garbage left by others? You’ll feel a sense of accomplishment and local wildlife, our water systems, and planet thank you for your efforts! Electronics: try a “digital detox” by leaving your phone, tablets, and gaming devices behind. Resort to conversations, walks, or reading a book instead. If you’re looking to play some music, this portable solar speaker looks pretty cool! Wildlife: beach trips are a great chance to experience nature, but it’s important to respect and leave wildlife alone. Feeding wildlife trains them to see humans as a food source, which can put them in harm’s way by not fearing hunters, having them wander into traffic, or be seen as pests. Our snacks are often very unhealthy for them too! Avoiding single-use plastics and cleaning up after yourself at the beach ensures that no animals are trapped in or poisoned by plastics. 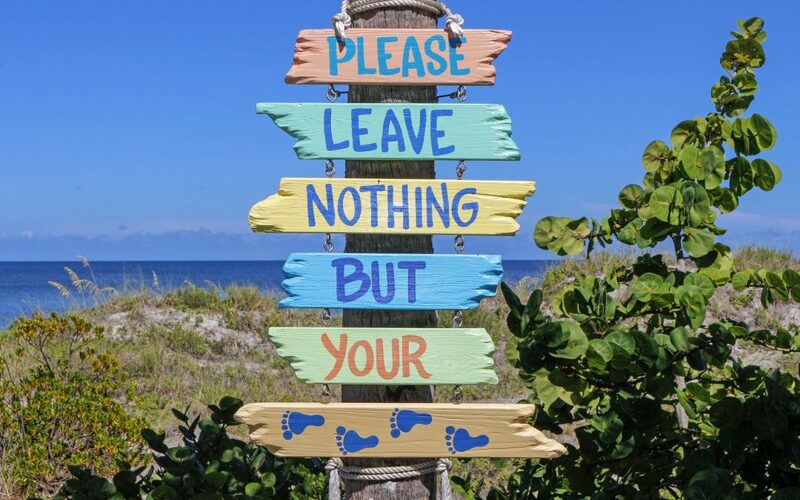 Enjoy the outdoors: as long as you are leaving no trace and making sustainable choices at the beach, spending time outdoors and in nature is a great thing! It makes us appreciate our environment a lot more and is often a more sustainable summer activity, when compared to other options like amusement parks.